Mental Health – how are children and young people affected? In February we marked Children’s Mental Health Week – a week dedicated to equipping children with the tools to maintain good mental health. Mental health and the provision of services to support children and young people with mental health disorders are at the forefront of public health policy, having been “dangerously disregarded as secondary to physical health”, according to the Prime Minister. The Health Secretary Jeremy Hunt has also pledged to improve children’s mental health services. Initiatives like Children’s Mental Health Week are great ways of raising awareness to continue this improvement. So what do we know about children’s mental health, and the provision of these services, at the moment? The most recent comprehensive survey data we have on young people’s mental health is from 2004 when it was found that around one in ten young people aged between 5 and 16 had a clinically diagnosed mental disorder. 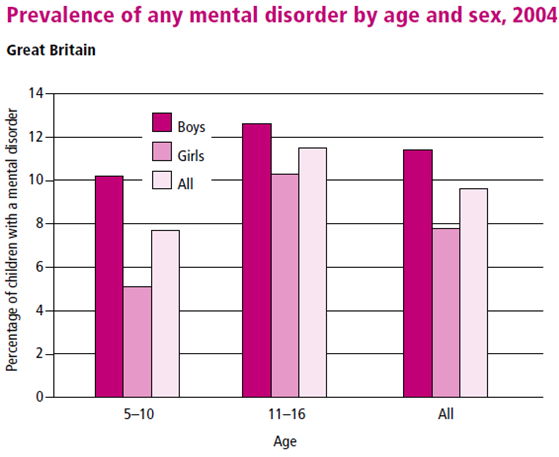 As you can see from the graph below, boys were more likely than girls to have a mental disorder (11% compared with 8%). Also, older children were more likely to have a mental disorder (12% of 11-16 year olds compared to 8 per cent of 5-10 year olds). Throughout the last 13 years, there has been some research into certain elements of children and young people’s mental health and service provision, which gives us some idea of the state of things at the moment. ONS research into children’s mental health and well-being found that 1 in 8 children aged 10 to 15 reported symptoms of mental ill-health in 2011 to 2012. Looking at data from a Strengths and Difficulties questionnaire, which screens the behaviour of children aged two to 17, it also found children who spent over 3 hours on social websites on a normal school night were more than twice as likely to show symptoms of mental ill-health. One report by the Education Policy Institute in April 2016 found that on average, specialist child and adolescent mental health services are turning away almost a quarter of the young people referred to them for help. Children had to wait one month on average for a first appointment, and two months until the start of treatment. The world has changed a lot since the last comprehensive mental health survey. In 2004, Facebook had just launched, the iPhone was still 3 years from its launch and the first tweet was yet to be sent on Twitter. We therefore need new national survey data that can provide updated estimates on the prevalence of mental health disorders in children and young people across England, particularly in this age of social media. This evidence will help to shape government policy and decisions in this area and make sure services are meeting the needs of today’s children and young people. NatCen and ONS, on behalf of NHS Digital, have recently launched the National Study of Health and Wellbeing – a study which has this as its primary aim. The survey will cover 9,500 children and young people aged 2-19 years old, and provide estimates on the prevalence of mental health disorders of children and young people in England. The study incorporates standardised tools that measure psychological wellbeing and mental health, such as the Strengths and Difficulties Questionnaire (SDQ) and Development and Wellbeing Assessment (DAWBA) – developed by YouthInMind who is our collaborator on this study. The survey will also provide data on various topics such as cyberbullying, social media and service use. Interviews are well under way and will be in field until late summer 2017. We expect that the findings will be published in 2018. The results will provide more information about the mental health of children and young people, helping the Government, NHS and wider society to better understand and support those facing mental health issues. This blog post was created in partnership with NatCen’s Franziska Marcheselli. Franziska is a researcher in the Health & Bio team. 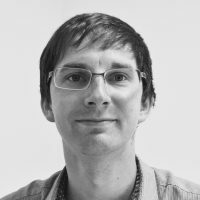 The above blog is also published on their website.